I don’t know how many times I’ve gotten my latpop all set up and ran the cord behind a hotel desk only to bump the magnetic connector and watch the cord fall down behind the desk. Since this doesn’t use an adhesive, you can use it in multiple ways and when you need it somewhere else you can pop it off of the surface without causing any damage to that spot. This can hold keys, your pens and any cords you’re concerned may fall down into a dark crevice the second you unhook it. It is even a tight enough clamp that you can hold single pieces of paper. 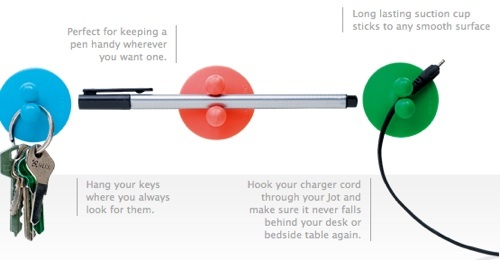 Since it does use a suction cup you’ll only be able to use it on a smooth and flat surface. These come in mixed colors, so you don’t actually get to pick a color preference. You can buy them individually for $4.95 through Dream Farm.